Our partner school EC Oxford is located close to the train station, Covered Market and Bodleian Library. The school is nestled among the many inspiring colleges of Oxford University, so you’ll really feel the student atmosphere when studying here! The school has 15 Classrooms, a capacity of 204 students and 17 Student computers which can be used. The school has excellent facilities such as Interactive Whiteboards, Wi-Fi, a library, Self-study room, a student lounge, kitchen area and of course you enjoy the “orange carpet experience” which gives you a real welcome the first day at school. WHAT IS THE ORANGE CARPET EXPERIENCE? It’s your first day of school and you will literally walk along the orange carpet! You will receive the best possible welcome, including refreshments, music and 100% of the school team’s attention. This is your one-of-a-kind VIP experience so you can enjoy every moment of it. The day includes a short orientation, followed by lessons to show you how you’ll learn at EC, and information on what to expect during your stay in your city. It also includes add-ons such as a Sunday activity for all our new students to get to know each other before their first day at school and an end of course ceremony where you'll get your course certificate. 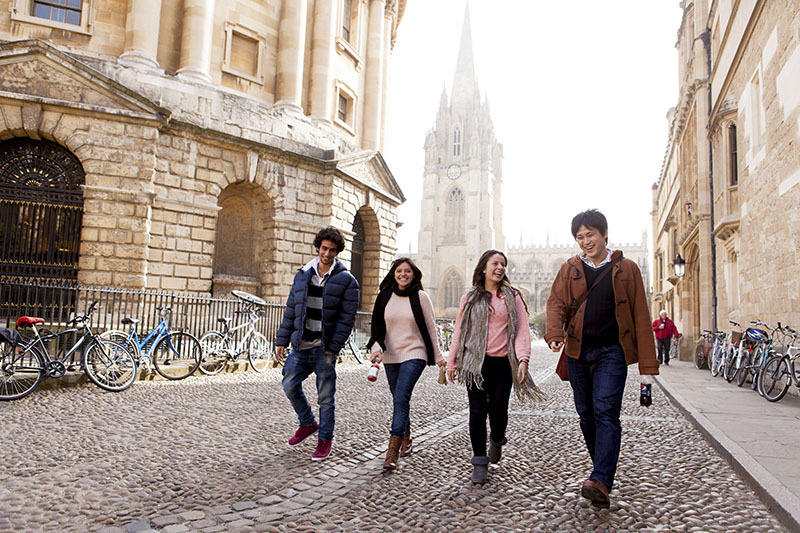 The school will organize several cultural activities for you to get to know Oxford and its surroundings even better. Some are free of charge, but for weekend excursions to Cambridge or London for example, you’ll have to pay a price (approx GBP 35). The school also offers several academic activities free to students such as lectures and English skills clinics. Of course you can also discover the city yourself by visiting one of the interesting places of the city, like Rivers Museum, University of Oxford, the Botanic Gardens, Covered Market or the Bodleian Library. See for more information the example of a monthly activity calender. The intensive course consists of 20 or 30 lessons per week, each lesson 45 minutes. The maximum amount of students is 15 per class. Lessons may alternate between morning and afternoon sessions. Private bathroom supplement host family single room: € 91 per week (High season), € 85 per week (during low season). Surcharge for special dietary requirements: € 55 Per week (please indicate on the booking form of you wish to book this option). Minimum age for the summer residence is 18 years. Minimum age for the apartment with students is 18 years. Minimum age for the shared apartment with locals is 18 years. The price is valid for arrival at Heathrow Airport (LHR). Please indicate on the booking form at which aiport you would like to arrive. In 2019 the school is closed on: 01/01/2019, 19/04/2019, 22/04/2019, 06/05/2019, 27/05/2019, 26/08/2019, 25/12/2019, 26/12/2019. Missed lessons due to bank holidays will not be refunded or rescheduled. STUDENTS UNDER 18 must book homestay for the duration of their course, return airport transfers (if arriving and departing between 8PM and 8AM) and provide a parental consent form. If you would like to finish your language course with an official exam, for example because you want to study at an university in England or Ireland, we recommend the IELTS exam preparation course. The IELTS course (preparing you for the International English Language Testing System) consists of 30 lessons per week, with a minimum duration of 4 weeks. You can take this course to prepare for university, as the IELTS qualification is required by most British, Canadian, Australian, Maltese and South African universities and, in some cases, American academic institutions. During the course you will focus on three key areas to help you achieve a great score quickly and easily: helpful exam strategies, effective exam thinking, and studying only the English you need to pass the test. You’ll have expert instructors with expert knowledge of the exams, and many years of experience teaching English. Usually, the exam takes place on a Saturday after the course. Due to the exam date it is necessary to stay until Sunday (price extra nights on request). Please note: in 2019, this course consists of 20 lessons per week. If you want to take the IELTS exam in Oxford after you have finished your language course, you need to register long in advancen at www.ielts.org. The IELTS course is recommended for a minimum period of 4 weeks. If you would like complete your course with an IELTS exam in Cambridge, please contact StudyTravel for the correct starting date. You will also improve your practical workplace skills such as giving presentations, compiling and writing a CV, preparing for an interview and telephone techniques. Private lessons are the best way to quickly improve your English language skills, and a big advantage is that you can completely focus on the aspects of the language that are important to you! You can book 10 or 20 individual lessons per week, but if you wish to book fewer or more lessons, please contact us for a personalized price quotation. Share in the daily life and experiences of an English-speaking family: a great opportunity to immerse yourself in local life, and practice your English in a friendly and informal atmosphere. You can choose host family accommodation with a single or double room and breakfast or half board. Homestays are located in residential areas, at a 30-40 minute bus ride from the school and the city centre where students can engage in a variety of cultural events. The Summer residence is a perfect accommodation for international students, located in Headington Oxford, at a 20 minute bike ride from the school. The building offers flats of 4-6 bedrooms each, with a fully equipped shared kitchen and lounge area. Each room has an en-suite bathroom. Bed linen will be provided, but students need to bring their own towels. There are coin operated laundry facilities available. A weekly cleaning is included and each room has free internet. At 2 minutes from the residence you find local shops and the bus stop. The minimum age to stay in the residence is 18 years old. The residence is a great place for students to live and study with well-furnished studios finished to a very high standard. Each studio is complete with a deluxe en-suite shower room and a modern kitchenette.Students will have access to on-site laundry facilities, a comfortable and spacious common room, as well as secure bike storage. Cleaning will be provided on a weekly basis, apart from the first arrival week and final departure week. Towels are not provided, please bring your own! Well located in the heart of Oxford, the residence is close to the city's cultural and historical centre. Situated right next to the renowned Magdalen College, students can easily assess the rest of the University of Oxford’s buildings, which are only a short distance away. The residence is less than a mile from the city centre, approximately an 18-minute walk from EC Oxford. The shared student accommodation is a lively apartment complex at just a 15 minute walk from the school, where you can find other students from universities and colleges residing. You’ll have your won bedroom with plenty of storage for clothes and study materials. Furthermore you’ll have access to a spacious living room and a fully equipped kitchen. Other facilities include: Wi-Fi, laundry, bike storage and secure entry system. There will be a weekly clean throughout your stay to ensure you are comfortable in the apartment. In Oxford, you have the unique opportunity to live together with locals and thus get an insight into everyday life, to use your English outside of class and possibly make new friends! You can stay here in a single or double room (double room only if you are traveling with someone else). The accommodation with locals does not include meals.